Moraira is a small town located in the region of Marina Alta, Alicante . Strict planning laws and careful town planning have allowed conserve Moraira town as one of the best resorts on the northern Costa Blanca. Only 40 years ago it was only a small group of fishermen's cottages by the sea and administered by the neighbouring town of Teulada . Now Moraira has gained some independence with its own town hall and the new medical centre. The market is held every Friday in the free car park where you can find a variety of products, from fresh fruit and vegetables to traditional flamenco dresses. Moraira is situated 8 km from the N-332 and A-7, and seems to avoid the tourist congestion that some of the neighbouring resorts supported. The population (according to the latest 2007 census) was 13,000, of which 60.37 % were foreign nationals with increases in the summer months.Without any doubt, Moraira is a great place to buy a house or other property by the sea. Where are our properties for sale in Moraira? 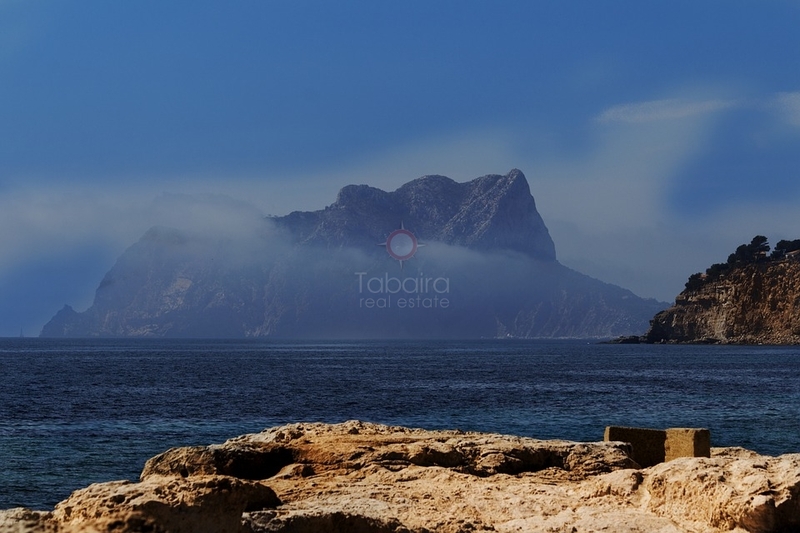 The properties for sale in Moraira that Tabaira Real Estate offers its clients, are located 6 km from the inner core of the population (Teulada) and have 8 km of Mediterranean coast. The number of inhabitants that has been encrypted since the last census in 2007 has been 13,000, of which 60.37% belong to a foreign population. This percentage generates more records every year, since many people from outside Spain decide to choose Moraira as their new home. These data perfectly explain the role that Moraira has gained over time. More and more people are interested in buying a house facing the sea, enjoying the Mediterranean climate and above all, discovering the beaches of the Costa Blanca. All those opportunities, you can live in Moraira and Tabaira Real Estate. El Portet Beach is located in the Port of San Roque and is protected by Cape Cap D'Or. The beach has 330m long and 10m wide with access for the disabled. The water is warm and shallow, ideal for children. Very close to the beach, there are bars and restaurants to taste the Mediterranean cuisine. Have a relaxed coffee or savor the exquisite paella. L'Ampolla is the main beach of Moraira, there is a car park, bar / restaurant and a playground for children. The beach measures 240 meters long and 40 meters wide, has fine sand and a beach watchman in the summer months (between 11 a.m. and 7 p.m.). Les Platgeteshave two coves and a promenade with a viewpoint. Its waters are crystal clear and combine areas of fine sand and rock. The beach measures around 200 meters in length and 20 meters in width. If you bet on Moraira, you will have the opportunity to immerse yourself in all the customs of the city, as well as participate in each of its celebrations. In short, Moraira is a perfect city to reside. Remember that in Tabaira Real Estate we have a wide selection of properties for sale in Moraira facing the sea. If you are interested in discovering all the qualities of Moraira, do not hesitate to contact us today.